Technical Update | Finlay Minerals Ltd.
Finlay and New Nadina have been exploring broadly similar geological settings (host rocks, intrusions, age) historically known, structurally controlled precious and base metal related veins and breccias. 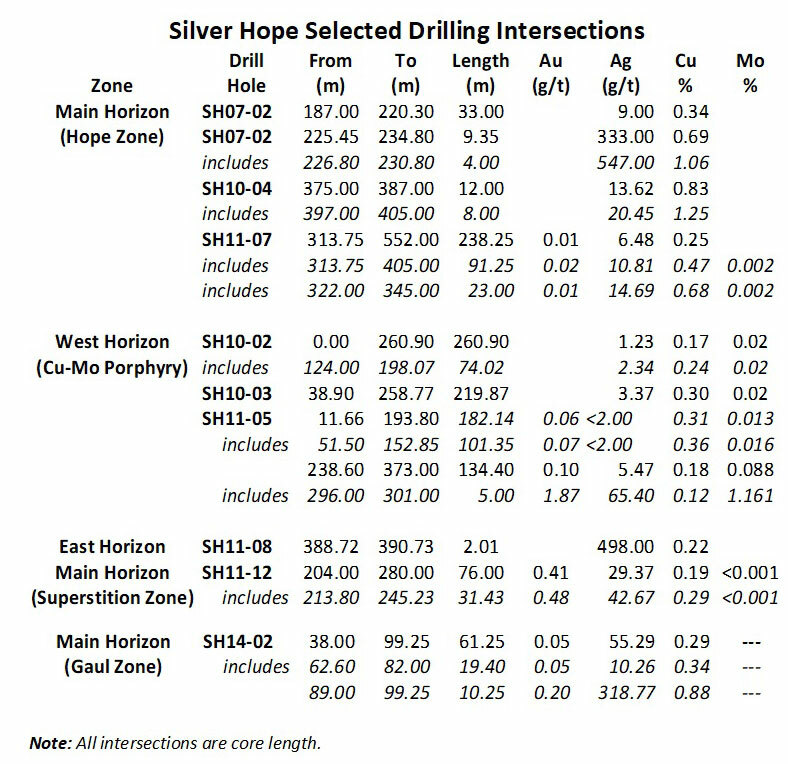 Three mineral occurrences at Silver Hope (Main Horizon) and the former Equity Silver Mine’s Main and Southern Tail deposits are situated along a five kilometre NNE oriented lithologic and structural trend. Finlay’s exploration programs along the Main Horizon consisted of geochemical sampling, airborne VTEM, three phases of increasingly deep induced polarization (IP) surveys and gravity surveys along with four diamond drilling programs. Over the past several years an increasing number of companies have successfully used geological and geophysical data to locate large, deep seated “feeder” porphyry systems. These mineralized zones are often found beyond the bounds or depths of historic deposits, former/currently operating mines and historic drilling. Examples include the Copper Mountain Mine (Copper Mountain Mining Corp), the New Afton Mine (New Gold), the Mt. 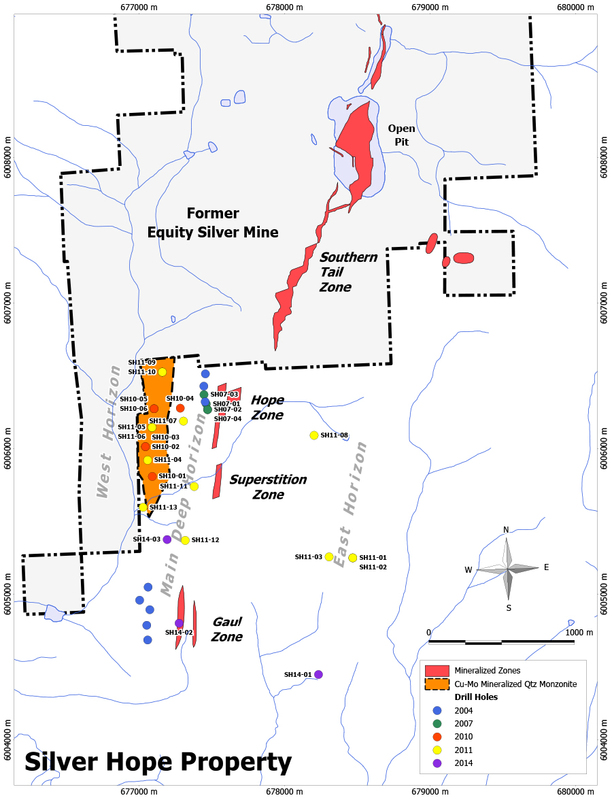 Polly Mine (Imperial Metals), the Kemess Underground and Kemess East deposits (AuRico Metals), the Red Chris Mine (Imperial Metals) and the KSM Project (Seabridge Gold). Finlay has conducted only a very limited amount of deep drilling that is insufficient to complete a mineral resource estimate. In 2010, drilling of a large IP anomaly parallel to the Main Horizon resulted in the discovery of a previously unknown Cu-Mo porphyry system (the West Horizon). SH11‐05, a vertical hole, cut Cu‐Mo mineralized porphyry over 90% of its 603 metre length and ended in mineralization. Of note was a molybdenite-rich breccia zone between 296 and 303 metres within which a one metre sample graded 8.54 g/t Au, 121 g/t Ag and 1.47% Mo (See photo below). Photo 1 - Molybdenite Rich Breccia Zone SH11‐ 05 (299 ‐ 303 m) grading 1.88g/t Au, 65.4g/t Ag, 0.12% Cu & 1.16% Mo. 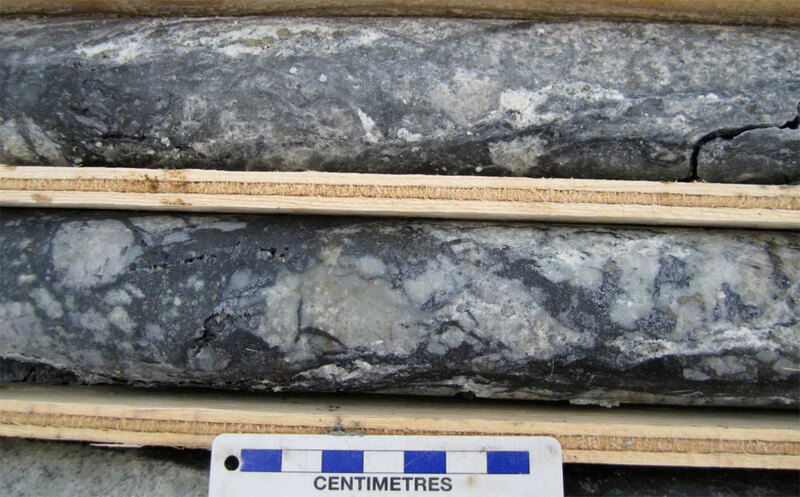 Thus far drilling has encountered Cu-Mo mineralized porphyry for a length of nearly one kilometre and is open to depth and along strike. Drill hole SH11‐06, an easterly angled hole drilled from the same site as SH11‐ 05, defined a steep dipping mineralized porphyry contact at 298 metres and was terminated at 735.8 metres. Prior to this no historic holes had penetrated to such depth. Beyond the Cu-Mo porphyry, the hole intersected mostly volcanic rocks accompanied by variable amounts of pyrite, chalcopyrite, arsenopyrite, sphalerite and galena. Several intersections ranging from 13.50 to 72.10 metres long contain substantial amounts of copper, multi‐gram silver and locally anomalous lead and zinc. Anomalous molybdenum from the intrusive contact to 505 metres are believed to be related to hydrothermal fluids moving laterally from a deep porphyry system. Strongly anomalous tellurium and tungsten in the last 100 metres are also suggestive of the thermal effects of a deep intrusion. Drill hole SH11‐ 12 located nearly 800 metres southerly of SH11-05/06 resulted in another significant discovery. This hole also tested an IP anomaly below the depth of historic holes in the Superstition Zone (one of the three known mineral occurrences- see above map). Intense alteration, brecciation and silicification were encountered often accompanied by abundant pyrite, arsenopyrite, chalcopyrite, sphalerite and minor galena and molybdenite in fractures, tension gashes and veinlets. Beginning at a down hole depth of 204.00 metres this hole returned 76.00 metres grading 0.43 g/t Au, 29.37 g/t Ag and 0.19% Cu (News Release titled “Finlay Minerals drills 76 metres of 0.43 g/t gold, 29.367 g/t silver & 0.19 copper (0.91% CuEQ) in a new style of mineralization on the Silver Hope Property”, dated November 29, 2011). This intersection contains among the highest gold values of the drilling programs with five samples assaying >1g/t Au and one sample at 9.4g/t Au. Three core samples contain over 100g/t Ag with the highest grading 747g/t Ag. This new discovery also remains untested at depth and along strike. Photo 2 - SH11-12 (218.0 to 220.0m) grading 1.48g/t Au, 54.9g/t Ag, 0.11% Cu, 1.25% Pb/Zn. Most recently drilling at the Gaul Zone (part of Deep Main Horizon), the most southerly mineral occurrence, drill tested an IP anomaly and intersected high-grade Cu and Ag lateral to the historic drilling (See photo 3 below). SH14-02 intersected 10.25m grading 318.77g/t silver, 0.88% copper, and 0.2g/t gold within a 61.25m intersection grading 55.29g/t silver, 0.29% copper, and 0.05g/t gold. Lastly, high-grade silver along with significant amounts of copper and tungsten were encountered in a 2.1 metre fault zone in hole SH11-08 while testing a large, strong IP chargeability anomaly along the East Horizon. This intersection is believed to represent “leakage” possibly from a deep porphyry system. 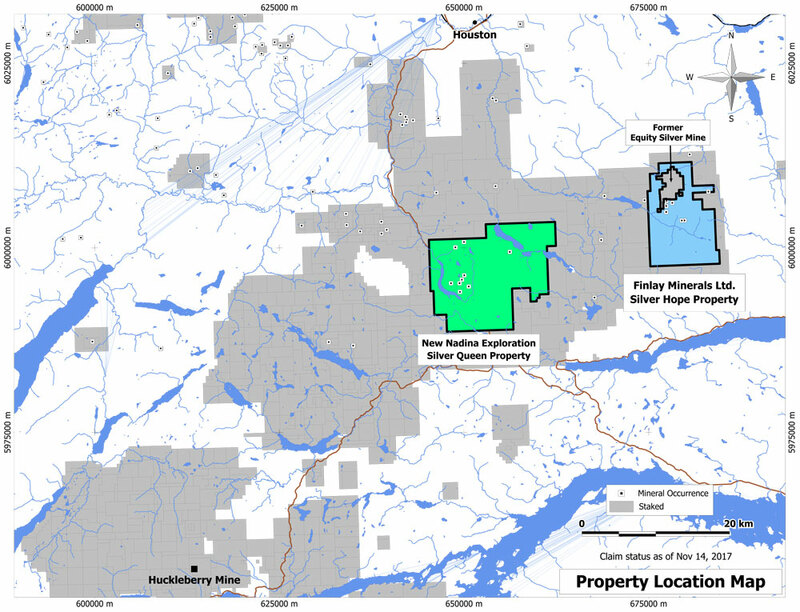 Finlay plans to continue vectoring into the source of the source of the Main Horizon Ag-Au-Cu-As-Sb mineralization by expanding the deep IP survey, seeing if the IP links into the deep existing gravity feature, and continuing to drill to depth. This has been encouraged by the deep drilling of New Nadina Explorations on the Silver Queen project and other deposits in BC. Further details of the Silver Hope exploration efforts can be found on the Finlay Minerals website at www.finlayminerals.com under the Silver Hope Property page.